June 14, 2016 – Walnut Creek, CA & Los Angeles, CA – Video game publisher Maximum Games is excited to announce their complete lineup of titles to be showcased during this year’s Electronic Entertainment Expo (E3), at the LA Convention Center in Los Angeles, California from June 14th – June 16th. Maximum has revealed two brand new additional titles that will be featured at the show, expanding their already diverse lineup of games: the third-person action adventure game, Troll & I, and the highly anticipated sequel to the beloved The Golf Club, The Golf Club 2. Previously announced titles that will round out Maximum’s presence at E3 include the extreme action snowboarding game, Mark McMorris Infinite Air, the motorcycle-based combat racing game, Road Rage, and the futuristic, sci-fi adventure game designed specifically for virtual reality, Loading Human. Maximum Games will be on the show floor at Booth #2605 in the South Hall of the Los Angeles Convention Center from Tuesday, June 14, 2016 through Thursday, June 16, 2016. In addition to their full run of titles, there will also be plenty of exciting surprises and special giveaways in store at the booth. Don’t miss it as freebies will include beanies, t-shirts and much more. For attendees that stop by on Wednesday, June 15th, a special grand prize to one lucky winner will be given out by top pro-snowboarder, Mark McMorris – a Burton Process snowboard, Mark’s official board and the one used in Infinite Air! Troll & I is a game about adventure, survival and unlikely friendship. 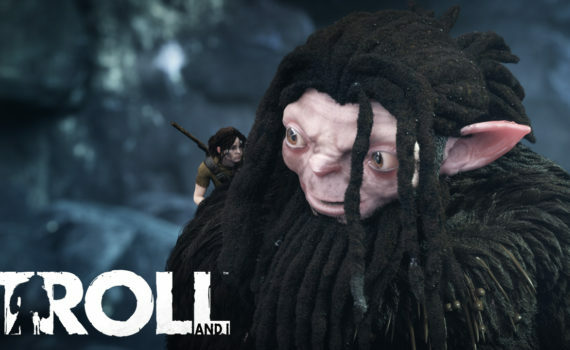 Troll & I features a compelling and progressive storyline as players will control Otto, a young boy forced to escape his destroyed village, and his companion, a mighty Troll. Together, they embark on a journey through the dense, harsh and unforgiving forest in a quest to defeat the hunters threatening their homeland. For more information about Troll & I, please visit: http://www.trollandi.com/. The highly anticipated sequel to the successful original title, The Golf Club 2 will continue to expand upon all of the highly acclaimed qualities the original is well-known for. Aiming to build the strongest, most accessible golf game so far, The Golf Club 2 offers multiplayer features, a new Career mode, and limitless customization, allowing players to rise to fame in a vibrant, virtual golfing community. Infinite Air is the first open-world, physics-based snowboarding video game built in partnership and close collaboration with top pro-snowboarder Mark McMorris. Infinite Air infuses the hyper-realistic experience of snowboarding with the thrill of achieving massive air in real-world competitions such as Slopestyle and Halfpipe. Players will explore a vast backcountry and compete against friends, building and riding their own terrain parks and carving first tracks in pristine powder. Featuring procedural mountain generation and a full feature editor, creationists can dive into the near infinite options to create and share their ultimate runs! For more information about Infinite Air, please visit: http://www.infiniteairgame.com. Road Rage boasts heavy melee-based combat racing that promises a pure adrenaline motorcycle ride for all. Featuring 42 story-based missions, players must take the helm as Ace, the newest member of the outlaw motorcycle club controlling underground crime in the city of Ashen. There are absolutely no limits in Road Rage: ride through a vastly open-world environment, play 11 distinct characters, customize your bikes and weapons, and rise to the top of the motorcycle clan! For more information about Road Rage, please visit www.road-rage-the-game.com. Specifically designed for virtual reality, Loading Human is a futuristic, sci-fi adventure that blends a deep story, interactivity and immersive physical gameplay. Loading Human is an episodic VR adventure game set in the 22nd century. Chapter One lays the foundation for the story as players take control of Prometheus, a scientist summoned by his dying father to embark on a mission to retrieve the Quintessence, the most powerful energy source in the universe. His father’s life is at stake and it’s up to players to save him. For more information about Loading Human, please visit www.loading-human.com. Please visit the Maximum Games booth which will be located at Booth #2605 in the South Hall of the Los Angeles Convention Center. For more information on Maximum Games, please visit: http://www.maximumgames.com. For more information about E3, please visit http://www.e3expo.com. Maximum Games ranks as a top 15 global video game publisher of interactive digital entertainment spanning all genres and supporting multi-platforms. The company’s mission is to provide a proven and strong hands-on approach to marketing, publishing and distributing. Established in 2009, the company was founded by female entrepreneur Christina Seelye, a seasoned executive of digital consumer products and channel marketing. Under Seelye’s leadership, the company has been recognized with numerous awards such as “Fastest Growing Tech Company” by American Business Awards, and has made the Inc. 5000 list of Fastest Growing Private Companies for the past two years. Maximum Games has offices in both the US and UK, and continues to expand its scope of global publishing and distribution via direct reach and strategic partnerships. For more information on Maximum Games, visit the company’s website at http://www.maximumgames.com.